Preventing falls on the work site is a top priority for anyone in the roofing industry. Traditional residential roofing and commercial roofing projects present their own unique challenges when it comes to preparing with safety equipment and procedures. Ensuring that your crews get adequate fall protection allows work to continue as planned, and prevents accidents and injuries from occurring. The BRFK50 Fall Prevention Kit makes all of this simpler by including the main components of a fall protection set up in one easy, affordable kit. 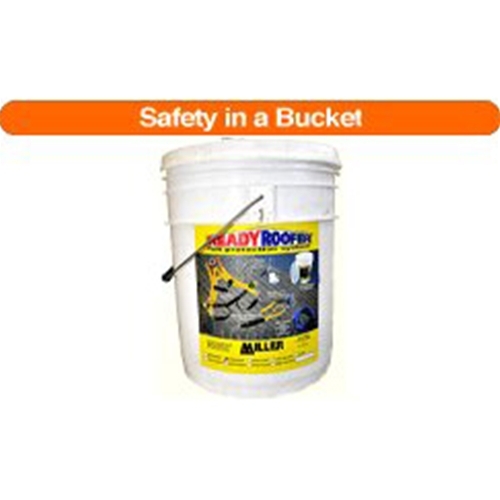 Users have a reusable, protective bucket to store all the items in, which also allows for easy and safe carrying as well as protective storage. Providing a kit for each member of your crews when required, is a small investment especially when comparing it to potential injuries, fatalities, lawsuits, OSHA fines and more. This Fall Protection Kit includes the full body safety harness, which can be adjusted to fit most workers. Also included is the choice between a 25 foot lifeline rope (50 foot option is also available), which you select the size based on your most common application needs. Providing a mix between 25 foot and 50 foot is also a good idea if you are purchasing several kits, allowing for more application versatility. A shock absorb lanyard and a rope grab are found in each of the BRFK50 kits, as well as a reusable roof anchor and the screws. Place your order today for the BRFK50 Fall Protection Kit with Intech Equipment and Supply. Call our trusted professionals and start your safety equipment line up, or supplement existing gear today.